Earlier this week, we marked the autumnal equinox. I always forget the difference between the “solitices” and the “equinoxes”. “The seasons are a powerful force in our lives. They affect the activities we do, the foods we crave, and the clothes we wear— and quite often, the moods we are in. The seasons officially change once again on Sunday, with autumn beginning in the Northern Hemisphere and spring starting in the south”. 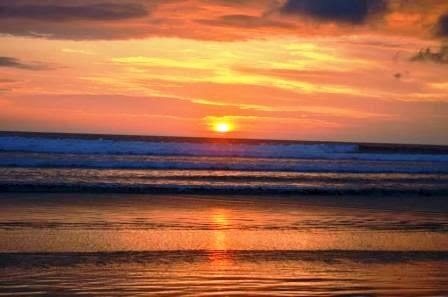 So, of course here in Ecuador, it is the beginning of our spring. I’ve had quite a few locals (and gringos) tell me that – living this close to the Equator – the effects of the solstices/equinoxes and the full moons are felt more intensely…and I have to agree with that, to some degree. Generally, this is the time of year when our weather in this pocket micro-climate is usually dreary (and frequently “drizzly”, though it is the “dry” season). This is our fourth full-time “winter” here (June through November), and each one has been unalike. I’ve given up predicting the weather. Our first one was sweatshirt/sweatpants chilly, overcast, and very wet – and lasted for the full six months. Every local said then that they “couldn’t remember when it was this “COLD” in Olón. Every year has been different, but none has been as nippy or as enduring since then. We’re looking forward to the coming summer, and we've had exquisite weather recently. Earlier than usual, but then again "winter" started earlier this year too...so maybe we'll have a sunnier fall (whoops, I mean "spring") this year on the Ecuadorian coast. We took long, peaceful walks on the beach last week (as did everyone in town). The “king tides” happen about once or twice a year. The “king tides” are long, relatively slow and shallow tides that come up for a few days about 20-50 yards further than usual (up to/or into the seafood cabanas on our Olón beach, and to beachfront property fence lines). Don’t ask me to explain this. I have tried to research more, but still haven’t found definitive answer about the confluence of events that causes this to happen, but I have witnessed these king tides happening about once or twice a year. I guess the main thing to “take away” from this post is that we “are opposite” on this southern side of the Equator. About five years ago, I actually did have a visiting friend convinced that the toilets flushed counter clock-wise and the sun rose in the west. But some things don’t change...even here. The sun still rises in the east, and still sets in the west, over the Pacific Ocean. Most times of year, we have breathtaking ocean sunsets here. But try finding the Big Dipper on a clear night…or the damn elusive Southern Cross, which I still can’t find/recognize. Also, Ecuador is not a country in Africa. Another question that was frequently asked A LOT when we first bought our properties here six years ago, though not asked much anymore – given Ecuador’s extensive exposure in the media lately. We also went up to La Rinconada one day last week to a friend’s house (a local artist that Todd commissioned) who presented us with a 3D Sketch-Up for our house build, and am very excited about the ideas he came up with. Now, to fine tune before we have blue prints drawn up. La Rinconada is a small town about twenty minutes north of us – a beautiful area, adjacent to the Machalilla National Park. Islote Los Ahorcados in right background. The annual CITUP bus parade just passed through town a couple of nights ago. Still kind of scratching my head about that. I've got a few videos, which I posted on You-tube, since I can’t easily insert them into my Blogger posts anymore. "Olón Chicken Bus Parade #1"
"Olon Chicken Bus Parade #2"
Usually this bus parade happens around 8-10PM before the yearly “taste of coast” event, though I haven’t seen it advertised this year. (Reference the post “Knocked Up”). Although we do have an Olón town party coming up in our park this Sunday night, with a popular Ecuadorian comedian, some dancing, and some prizes. The rest of the pictures posted here are just random ones taken during the last few months. for some candy from our bowl. lunch a couple of days ago. There are a number of these roads that lead back into the jungle, and one does not need to go very far to get into a more “jungly” environment (less than a quarter mile, becoming more dense and isolated further down the roads). The change in vegetation and birdlife is vivid in such a short distance between the beach side and hill side of the Ruta del Sol. Of course, the plants are more lush and the birds more colorful and diverse on the hill side. I was in pursuit of a particular arbusto de ají which I heard might ripe now, for some pico de gallo that I was making for dinner that night. I love the ají peppers here, but only the larger ones are sold in the markets now, and they're not hot enough for me. I was looking for the little tiny ones that have a wicked bite, and a variety of ají bushes grow wild. We used to have one ají bush in the yard of our old house until it died – I think because I flat out picked it bare using the peppers. It was a beautiful walk. I had to ford the Rio Olón at one point (which, as you can see from the picture wasn’t deep at the crossing). About one hundred yards up-river was a family washing their clothes in the water and I took the above shot using the telephoto function on the Canon PowerShot A2500 I’m driving now. These are some of the pictures I got on that hike. Alas, I didn’t find the elusive ají plants that I was looking for, but really enjoyed the afternoon walk, met some really nice local people along the way, and think I’m going to have to do this more often. In fact, I’ve been walking a lot lately. Earlier in the week, I headed to new friend Denise Morris’s house to pick up a box of Capt’n Crunch that Karen Kimbler (“Kimbler’s Exit to Ecuador”) brought down for me on her last trip to the States (a couple of months ago). This box of cereal has been around, to get it into my hands here on the coast. It may have more stamps on its passport than I do. Anyway, I had a great time getting to know Denise, and then I decided to walk 10 minutes on down the highway to Manglaralto to pay some bills. Trying to capture that picture showing my speed was a little trickier. If I took it while walking, the pictures were blurry. If I paused, the display disappeared. I repeatedly backed up 12 feet trying to get a picture, finally getting this one – I believe – by taking a running start and leaping in mid-air to snap. I’m sure if any of the kids at the school across the street saw that, they must have thought I was one crazy gringa. Our dog Daisy is in “pseudo” heat again. We had her fixed shortly after we adopted her 3 years ago**, but the vet didn’t take everything out. For the last couple of seasons (twice a year) Daisy now gets an injection to prevent her from being receptive to eager suitors as soon as we notice the signs. That’s worked pretty well (the hope being that after a few times, her “girl parts” will eventually shrivel up before we need to put her through surgery). But it still doesn’t stop the fellas from trying, and all the commotion that involves. We try and keep her inside as much as possible during the love season. And we seem to have acquired a new wannabe family member. Our Ecuadorian next door neighbor’s dog, “Keen” has taken a real shine to us, and tags along with Todd, Daisy, and me wherever we go. He’s such a scroungy mutt, but very lovable, though we don’t encourage him, since he belongs to someone else. Still, he sooo wants to be part of our family and proudly follows us around town all the time now, with that shaggy tail waving happily. Fortunately, birth control was not a factor regarding the next picture. 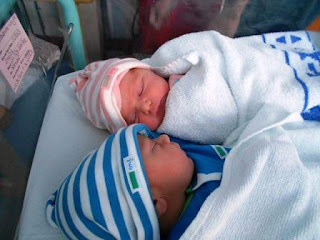 I have two new grandchildren I’d like to welcome to the world! Levi Brian and Isobel Katherine, born August 12 in England – and congratulations to proud parents Katherine and Clive Wright! Nearby "Mr. Grumpy's" vegetable stand. "Mr. Grumpy" not pictured - that's another guy in photo. * See the post "You Say Spondylus" for more about the Ruta del Sol/Spondylus highway's name. ** See "And Dog Makes Three"